Linen may just be the best sling fabric there is. It's strong, supportive, long-wearing, and is especially terrific for hot climates, since the fibers tend to wick moisture away and allow it to evaporate. Great from birth through toddlerhood. French twill is lightweight and sturdy, woven from 100% cotton. Brushed on the outside for strokable softness, the inside in the tail is smooth for ease of adjustment. Wonderful as a starter sling with newborns; its easy adjustment makes it great for learning to use a sling. Exclusive collaborations between Tekhni Wovens and SBP, you won't find these anywhere else! Jacquard-woven Repreve-blend slings are soft enough for newborns, but sturdy enough for the heaviest preschooler who wants uppies. Geek out with me on limited-edition fandom slings, too! 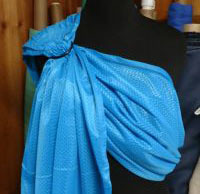 Nylon fabric makes for a quick-drying, lightweight sling -- playing at the pool or beach, or showering together during the off-season. Find out what makes SBP's water sling more comfortable for you and your baby!